The nice people from STAR newspaper in the Rage section , did a write up on us and added a nice video of our ” Drift Lesson” in Bukit Jalil on their website…though they got my surname name wrong , they did get my quotes right…which I think is most important!! Here’s the video with Cheaka in it.. 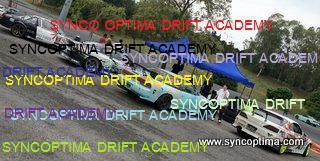 This entry was posted in Drifting, SODA, Sync Optima Events and tagged bukit jalil drift, drift lesson, malaysia drift, malaysia drifting, SODA drift, STAR, star newspaper on May 4, 2009 by skagee. After a long hiatus, Gerakan Belia 4B Selangor had decided to do one of their ,much anticipated Drift Akademi sessions in Bukit Jalil yesterday ( Sunday). Team WHAT which consist of Leong, Jenshen,Barry,Korlow,Leon, Kong, Cheaka and I were there to join in the fun and basically hang out. A total of 30 drifters had taken part in the session which was incidentally free of chrage, courtesy from the Ministry of Youth and Sports, with the help of the Belia 4B .Needless to say it was non stop drifting from 10am-7pm that day!!! The Feint0-D team were there too, in full force ,to support the event.. The drifters were also treated to a Para-gliding demo by two dare devils that braved the strong winds that day!! It great to have the Goverment to finally recognise and lend its support to this of sport. Please watch this space for more up coming events!! This entry was posted in Drifting and tagged bukit jalil drift, drift academy, drift akademi, malaysia drift, malaysia drifting on March 30, 2009 by skagee.